I’m up earlier than normal this morning as I heard that today was going to be especially hot. The Spanish news are forecasting temps in the region of 35c so the night before I get my gear ready for an early start. There isn’t much I would say about this albergue, I was asleep during most my time here but it was good to see my friends again. I leave after a quick snack of fruits around 5.30am. The sun is well under the horizon so everything is in darkness. I struggle to find the first arrow but I use my headlamp to figure out where things are. On leaving Ledigos, you are given two options to get to Terradillos de los Templarios, which is the next town. One is slightly longer so naturally people choose the shorter option, which I also choose. Again, remember that I am in pitch black with no other pilgrims. I walk on for twenty minutes or so, expecting to see lights or even an arrow. Nothing. Have I taken a wrong turn? I think I have, but I check GPS, just in case. I was walking away from the Camino in the direction of a town called “Poblacion de los Arroyos”! I’m glad I decided to check at that stage rather than walk blindly for a further 20 minutes. After a while, I was back on the Camino (yes it was the right one! )..the sun was beginning to rise and pilgrims were leaving Templarios. I remember my time there in 2013. It’s a tiny village with a shop, a church and two albergues. It is a typical Meseta town. The albergue I stayed in is fine and at that time alot of my friends stayed there that evening. It was a late night!! Back to now however, I walked to Moratinos where I had the most amazing breakfast. The cafe is owned by Bruno who also runs the albergue and trust me..get some breakfast there. It set me up for the rest of the day. Most of the day was along the road, using the Senda del Peregrinos (the soulless senda, in my books!). It was unspectacular and flat, but you have to take the bad with the good. I walked alone until I met up with Franz and Tina just outside of San Nicolas. Tom and Caroline had started earlier and were far ahead. 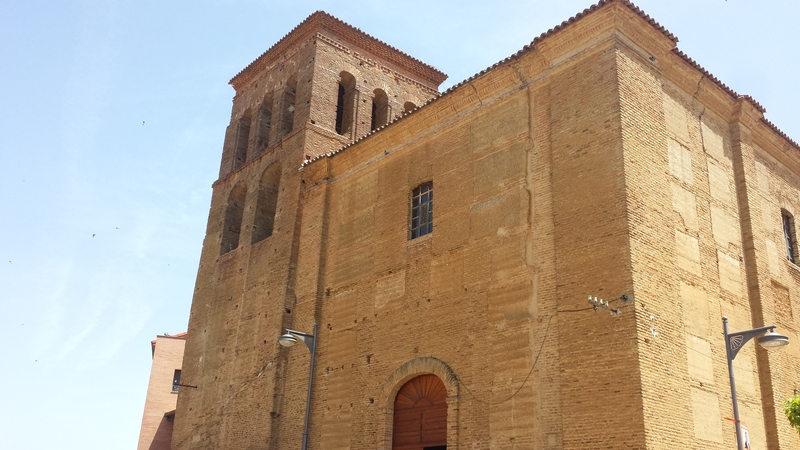 They had decided on staying in Sahagun and while I wanted to re-visit Bercianos de Real Camino, my leg was causing me enough concern to have a short day. I also decided to check into a pension as I was in need of a few more hours sleep. Maybe the 5,30am start this morning was a bad thing? 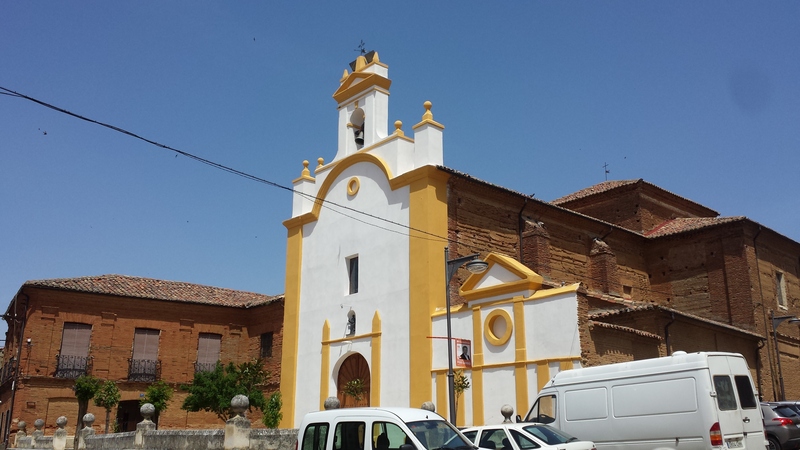 Before arriving in Sahagun, we stopped at the “Ermita de la Virgin del Puente” which marks the halfway point of the full Camino. This meant alot to pilgrims who had started in St Jean and to Franz and Tina who couldn’t believe they had walked so far in such a short space of time. Me? I had only started. 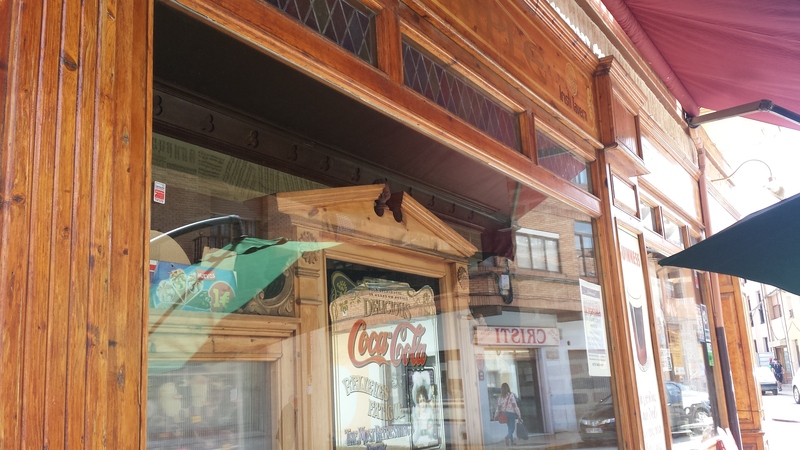 The temperature was reaching it’s highest at this point so we decided to move on to Sahagun. 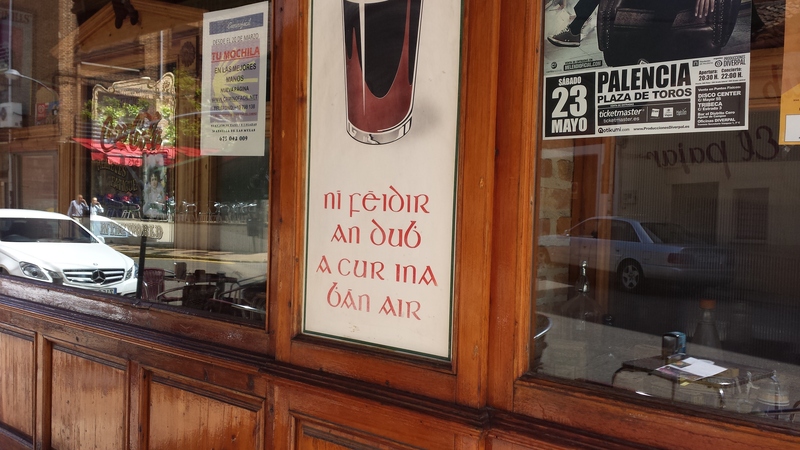 Eventually we see Tom and Caroline across from the main refugio sipping on a cerveza. They had already booked into a pension. Are albergues in Sahagun that bad? 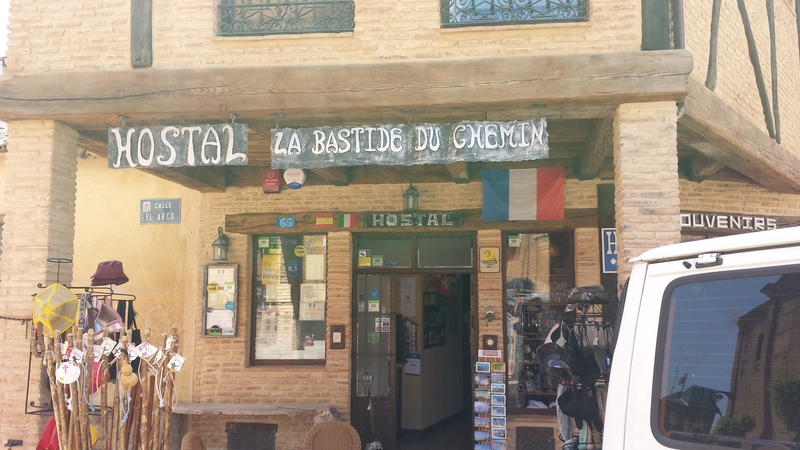 I checked into Hostal la Bastide which is directly opposite the main refugio, breaking into the last €50 note I had on me. I needed to call my bank to see what the problem was with my ATM card. After a long conversation, I was told to visit a bank as the problem was not with my bank. I walked (with trouble) down to the local BBVA and asked if anyone spoke English. One girl with a little amount told me that the problem was with the card and not their ATM machine. After another conversation with my own bank, I was told that the problem was with the card and there was nothing they could do. Hmm..I’m left with little over €20 with another week to go..time to think! Luckily I was with good people who said they would provide me with what I need. The Camino does provide, you know? I had an amazing meal later that evening in the plaza mayor. Siesta had just finished and with all towns in Spain, the town woke up with families pouring out into the square. Kids playing football, running around, with men and women talking about whatever. Sure beats sitting in front of a TV. It’s really interesting for me to see your train of thought from your day on the way – and also your battle with the ATM machines – I hope you got it sorted out!